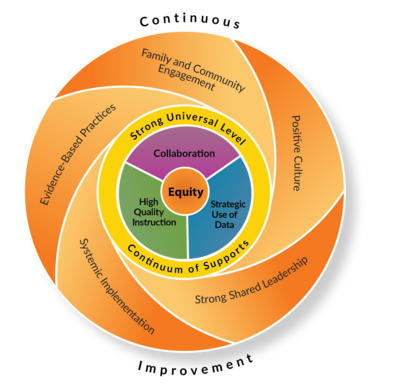 For Wisconsin schools and districts, implementing an equitable multi-level system of supports means providing equitable services, practices and resources to every learner based upon responsiveness to effective instruction and intervention. In this system, high quality instruction, strategic use of data and collaboration interact within a continuum of supports to facilitate learner success. Schools provide varying types of supports at differing levels of intensity to proactively and responsively adjust to the needs of the whole child. These include the knowledge, skills, and habits learners need for success beyond high school, including developmental, academic, behavioral, social and emotional skills. A complete list of the Trainings and Supports offered by the Wisconsin RtI Center for schools, districts, and CESAs to facilitate implementation of an Equitable Multi-Level System of Supports is included in our Training & Supports Catalog. Our trainings are typically offered regionally and can be found on our website: wisconsinrticenter.org/event/all and wisconsinpbisnetwork.org/event/events-calendar. Developing an enduring and integrated system of supports requires planning with a framework in mind. Academic and PBIS technical assistance coordinators will facilitate interactive sessions that support implementation of an integrated academic and behavioral system. School and district leaders will receive technical assistance and opportunities to network with peers while planning for fidelity and sustainability.